The worst part about being an adult is watching those around you eventually succumb to the process of aging. 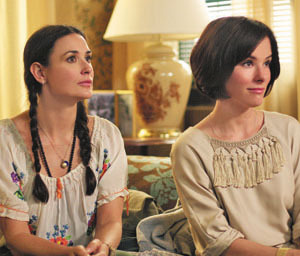 In Happy Tears, Jayne (Parker Posey) and her sister Laura (Demi Moore) run into the same situation when their elderly father’s (Rip Torn) battle with dementia causes upheaval in their respective ways of life. Laura is an urbane mother married to a gay husband. Jayne has been involved with her live-in love, an artsy trust fund baby with whom she would like to start a family. Jayne heads back to her childhood home to help Laura take care of dear old dad. Unfortunately, the old man is a mess. Not only is he surly, but he has lost control of his bodily functions and has taken up with an equally delusional ladyfriend named Shelly (played with great humor by Ellen Barkin). The sisters must learn to adapt to their new family situation, while coming to terms with their less than favorable adolescence and its ramifications on their adult lives. Happy Tears is directed by Mitchell Lichtenstein. He’s the man behind the cult classic Teeth. His signature style is playfully evident here as well. The cast is also fun: Moore is outstanding as the responsible and hard-pressed sister. Despite her awesome star power, she blends well into the genre, adding a touch of regal chic to the big screen. Posey is also fun to watch, given the disappointing fact that she’s once again playing a prissy fashionista. Still, with a movie like this I’m torn. What Happy Tears has going for it is the fact that it’s a sleepy little character-driven comedy with a retro feel dating back to the early 1990s when independent films were all about the interplay of those on screen. Unfortunately, over the past couple of decades, many indie movies have raised the bar and made it necessary for other low-budget pictures to go big or go home. Happy Tears is too much of a lightweight to hold its own with most contemporary releases. If one didn’t know better, this was a short film that got the greenlight to be extended into a feature, without enough concept to back up such an expansion. However, if you’re a cinephile, or merely a devout fan of anyone within the cast, you’ll like the movie for its occasional moments of hysteria and eccentricity. Happy Tears releases in select theaters Feb. 19. This article has been viewed 1036 times.